But the future of a few other senior players remains uncertain. Karl Lacey is a passionate Donegal man. 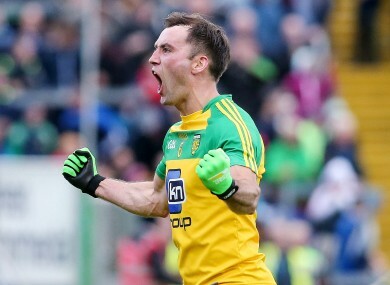 DONEGAL’S FOOTBALLERS HAVE received a massive boost as veterans Karl Lacey and Frank McGlynn have reportedly committed to playing on next season. Manager Rory Gallagher will have both former All-Stars available in 2017 as Donegal bid to improve on their season this year which saw them retain their Division 1 status in the league and reach the All-Ireland quarter-finals after losing the Ulster championship decider to Tyrone. While 2012 Footballer of the Year Lacey, 32, and McGlynn, 30, have committed to the panel it is believed the likes of Christy Toye, Neil Gallagher and Rory Kavanagh are yet to make their minds up, according to Donegal Sports Hub. Colm McFadden and Eamon McGee have already confirmed their retirement from the inter-county game. Email “Big boost for Donegal as Lacey and McGlynn commit for 2017”. Feedback on “Big boost for Donegal as Lacey and McGlynn commit for 2017”.